The Outlaw Volleyball Club was founded in 1991 by Ronnie Kaase, Phil Christiansen, and Carter Roesch and is currently directed by Ronnie Kaase. Kaase resides in Austin, Texas and has one son Jacob who played professional baseball for an independent team in Marion, IL, for 1 year and with the Texas Rangers minor league system for 4 years. He has a BA in Kinesiology in the Human Performance discipline from Huston-Tillotson University and a Masters in Sports Administration from Liberty University in Virginia. Kaase spent eleven years at Huston-Tillotson University (HT), a small Historically Black College and University (HBCU) as the Head Women’s Volleyball Coach, Sports Information Director, and Director of their NAIA Champions of Character (COC) program on campus. While at HT he was able to graduate 54 out of 98 student-athletes in the volleyball program and was moving into the teaching mode as an associate professor of Kinesiology. 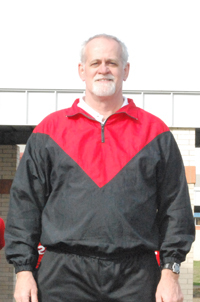 Kaase has been involved with the sport of volleyball since 1978 as a player, official, and coach. He holds a national ranking with the USAV as both a referee and scorer and retired in 2008 as an FIVB International Beach Volleyball Referee. Kaase earned the honor of working in two Olympic Games, 1996 in Atlanta, GA, and 2004 in Athens, Greece, and continues to help grow officials in the Lone Star Region of USAV for both indoor and outdoor. As the President/CEO of the Outlaw Volleyball Club, a non-profit junior Olympic volleyball program since 1991 it was developed for girls aged 12-18 to provide athletic training and to help them continue their academic career with possible athletic scholarships by attending college. The OVC has conducted summer camps at various high schools in Texas (Caldwell, Bryan, Blanco, Taylor, Manor, Jourdanton, and Lexington to name a few) as well as providing position specific clinics to help young volleyball players reach their next level of competition. His hobbies include horseback riding, dancing, reading or listening to books, and try to get in a little golf when he can. While growing up he was actively involved with the Boy Scouts of America (BSA) earning the rank of Eagle. Along with his four brothers they became the first family to have five Eagle scouts in the same family back in 1978. The scout Law and the values that were taught in the BSA were a major part up my upbringing in how I established the principles in which I live my life today. In 2005, I was appointed the COC representative for HT and I learned about how the NAIA uses the COC program to mold young student-athletes by teaching them about the five core values of a strong character in Respect, Responsibility, Integrity, Servant Leadership, and Sportsmanship. These values were a lot like the Scout Law from the BSA and I enjoyed working with the youth helping them to see the importance of having strong and positive character traits and sometimes it is hard because a lot of the youth that I work with are minorities and come from single parent families. Kaase’s personal and professional ethical codes are simple; follow the rules, use common sense, and lead your life in such a way that others will follow by the example you give them. I came across this quote when I was taking my class to become a COC instructor for the NAIA; “The best way to teach morality is to make it a habit with children” Aristotle, Greek philosopher (384-322 B.C.) This is why I believe that I am so involve with youth sports to help them learn how to make the right decision in both athletics and in life.